Double your sorting power, double your efficiency! Designed along the same principal as our double-decker rocking sifters, our stacking seives are two hand sifters of different mesh sizes that clamp securely together. When the seives are clamped together the operator can easily sift through two mesh sizes simultaneously. After the material in the top sieve has been processed, the top seive can be unclipped and removed, leaving the sorted smaller matix in the bottom seive. 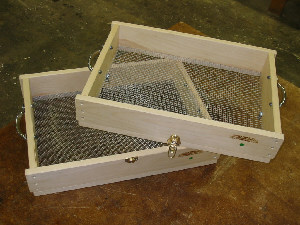 Screen area of each sieve is 14" x 20". Steel handles attached to the ends of each sieve allow for easy operation and protect hands from impact by the materials being processed. As with all our sifters, our stacking hand sieves are comprised of New England White Pine - durable, but light! For maximum stability, grasp the bottom sieve during use.